It has been a short stint as Secretary of the U.S. Department of Health and Human Services for Tom Price, who resigned from the post on September 29, 2017, two days shy of 8 months in the position. Spending only 231 days as Secretary, Price is the shortest serving HHS Secretary in U.S. history. 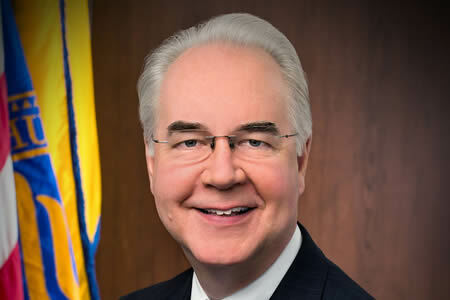 Price was nominated for the position of HHS Secretary by President Trump on November 29, 2016. The nomination was approved by the Senate Health, Education, Labor, and Pensions Committee on February 1, 2017. However, Price resigned under pressure following revelations about his extensive use of charter jets and military aircraft to travel across the United States for government work. Rather than use commercial airlines for travel, Price had spent more than $400,000 on private jets, even though commercial airline flights were available. Price had vowed not refrain from using private charter flights for travel in the future and offered to pay back part of the costs incurred, reportedly $51,887, to cover the cost of seats. President Trump said that would be “unacceptable,” leaving him little choice but to tender his resignation. Price will be replaced by the current Deputy Assistant Secretary for Health, Don J. Wright of Virginia. Wright was appointed Acting Secretary of the HHS from 11:59 p.m. on September 29. He will serve in the position until a replacement is found. There are several potential candidates for the position, including Scott Gottlieb, the current commissioner of the Food and Drug Administration, Seema Verma, administrator of the Centers for Medicare and Medicaid Services, and Former Louisiana Gov. and HHS assistant secretary, Bobby Jindal.